Combine two excellent New Orleans day trips with this 6-hour experience visiting Destrehan Plantation and going on a swamp tour. Visit the 1787 Antebellum house, including an 1811 slave revolt museum/cabin on the grounds along with its massive oak trees. Next take a swamp tour in the bayou to look for alligators, turtles, snakes, and other wildlife. Get picked up at your New Orleans hotel for this day trip, which lasts a little more than 6 hours. 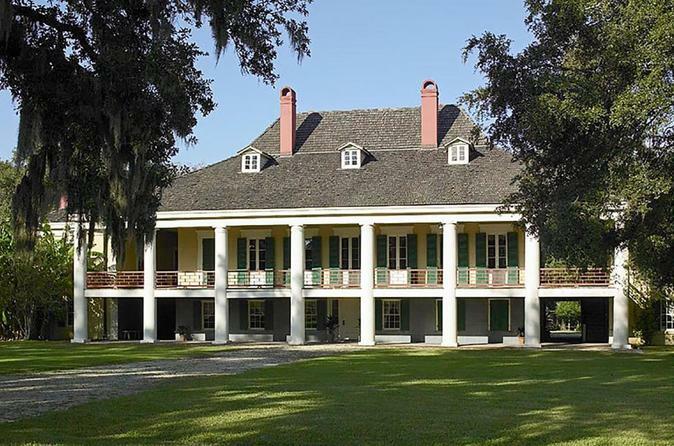 Start with a visit to Destrehan Plantation, established in 1787 and listed on the National Register of Historic Places. It remains the oldest documented plantation home in the lower Mississippi Valley. Travel through time from the French and Spanish Colonial periods through the Antebellum grandeur of the sugar barons to the ravages of the Civil War and the rebirth of reconstruction. Immerse yourself in the rich history of Louisiana when French was the language, and the white gold of sugar drove the economy. Family stories of those free and enslaved set against the fabric of history will intrigue every visitor to the site. The plantation exhibits an original document signed by President Thomas Jefferson and Secretary of State James Madison. Destrehan Plantation was the site where one of the three trials took place following the 1811 Slave Revolt, one of the largest slave revolts in U.S. History. During the Civil War, the Union Army seized the plantation and established the Rost Home Colony where newly-freed slaves learned trades enabling them to transition into a life of freedom. Located on the historic River Road, this Antebellum home with its plush green grounds and moss-draped Live Oaks watches over the banks of the Mississippi River just minutes away from New Orleans. A house tour takes roughly one hour, with time to walk the grounds and see the slave cabin. This may include time for lunch (own expense). Next, head for the bayou for your swamp tour. From the relaxed comfort of a covered boat, you'll drift slowly past a 2,000-year-old Native American burial mound, a Cajun cemetery and fishing village. Here, birds, snakes, turtles, fur animals, and gators are the kings of the swamp and easily spotted in Spring, Summer, and Fall. Gators do hibernate during the cold winter months, but lay on the bayou banks on warmer days. The slow drift of our tour boats through moss-draped trees and small waterways provide ample opportunity for viewing and photography. The tour boats are fully narrated and captains are natives of the Barataria Swamps with a background of gator hunting, fishing, and trapping. Boats have a roof, restroom, cushioned seats, and windows that can be raised or lowered during cold or rainy weather, along with plenty of standing and walking room.